The Atlantic has a nice long story about the National Valet Olympics, which I had no idea were a thing until today. They sound kind of intense! The competition consists of four timed events, with the overall winner crowned Best Valet. These are capped-off by awards for Best Team, Best Attitude, and Best Dressed. 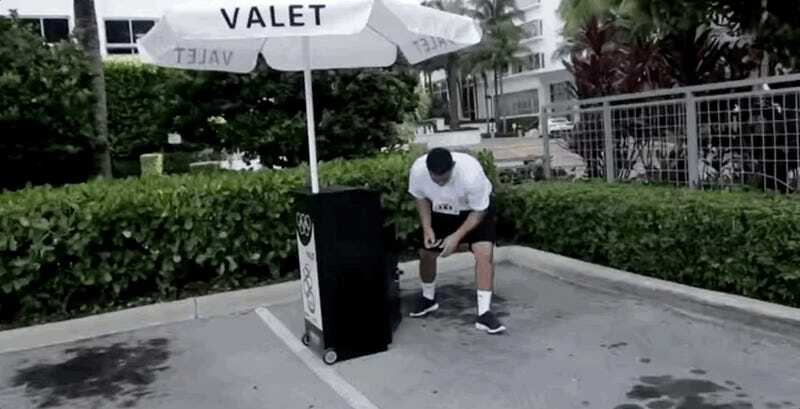 The first event, the Key Box Challenge, is a form of competitive OCD: Valets must sprint to a locked key box, match a dozen or so keys with their corresponding vehicle tags, hang them correctly on a metal door, then sprint back to the finish line. It seemed simple, but it was chaos. For some valets, the locker wouldn’t open; for others, it wouldn’t close; one athlete forgot the final key altogether and had to run back to retrieve it. Then came the Luggage Load. Beneath a soaring outdoor veranda with spectacular views, a brown Hyundai Elantra stood waiting. Its roof seemed to ripple in the heat. A few of the athletes looked apprehensive: The car had “an unusual trunk configuration,” I heard one say. The luggage cart, another noticed, had a broken wheel. And was that a slope leading down to the car? That could send the cart speeding downhill, its bags spilling out onto the concrete. For his part, Dumont was elated. This was perfect, he told me. It was exactly the right amount of difficulty. One athlete, Twain Frazier, a 23-year-old Ohio State grad from Towne Park, seemed to be in a state of deep concentration, silently communing with the luggage. Another packed the trunk so badly, it wouldn’t close, triggering a 10-second penalty. Others excelled, including valets from APC. Next up was Precision Parking, the photogenic centerpiece of the games. Valets must sprint to a car—in this case, a black Toyota Camry—leap inside, and roar out of the parking spot. There is no speed limit. Athletes then weave through 10 orange cones, park the car, put it in reverse, and do the whole thing all over again, backwards. Before the event began, there was a small controversy: Most valets had practiced on six cones, they said, not 10. Some walked the course in open disbelief, as if faced with driving the Nürburgring. Indeed, Precision Parking was the games’ real litmus test. APC’s Philip Ozuzu, 19, took his turns too aggressively and had to do many of them over again, costing precious seconds. When LAZ’s Matiyow was up, he careened backwards through the cones, his windshield wipers mysteriously waving in the heat. Finally came the Valet Relay, an exercise in contradiction and restraint: slow speed in the fastest time possible. Each valet must race a car across the parking lot without exceeding 10 miles per hour. A judge holding a speed gun clocks the pace. After reaching a parking spot, the athletes run back to the start on foot and re-rack their keys. APC had something of an advantage here thanks to their wind-sprint training. Ozuzu was a blur, looking more like a track star than a valet. I’m a little out of breath just watching this. You can (and should) read The Atlantic’s full story here.